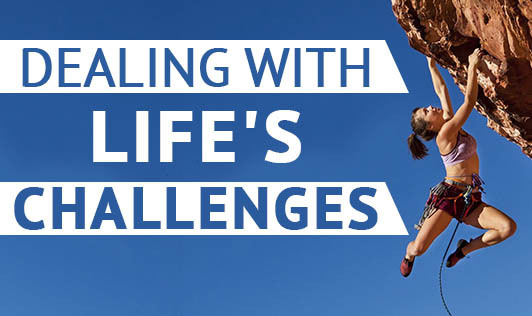 We're all faced with challenges in every area of our lives. Most people find it difficult to accept and deal with these challenges. The fact is that one will have to deal with difficult situations throughout his or her life, whether it is in personal life or career. Many people get really scared and run away from problems because they don't want to accept reality. Don't overreact: Overreacting to situations will only cause one to make bad decisions. When one is not in control of his emotions, he will end up making decisions that he will regret. It's important to become the watcher of your thoughts and stay calm so that you can make wiser decisions. Accept reality: Accept the way things and people are. You have to understand that everything is not going to be the way you want it to be. You will only become more frustrated with life if you're unable to accept reality. Don't try to change things you cannot control. Keep in mind that by accepting reality, you will be able to think more clearly about how to reach further towards your goals each day. Don't overanalyze: Don't overanalyze every situation as you will only have a very tough time accepting reality and you will think something is not right. Overanalyzing can also cause you to not take action on your goals which is only going to make you feel frustrated in the long run. Accept changes in your life: Most people resist change as it gets them outside their comfort zone. You may be unhappy or happy at times, but you have to realize that those two states of mind are not permanent; hence you have to train your mind to be at peace at all times irrespective of the emotional state you're experiencing. Avoid comparing your lifestyle with others: The key here is to remember that you create your own story and success in life. Avoid comparing your lifestyle with others because it will only make you feel frustrated. "Remember that effectively channelling your emotions, letting go of a negative past and having faith can help you attain the wisdom that life demands from you to get through even the most difficult challenges!"